This guide will familiarize you with the basic mechanics of the new Flight Planning and Filing system on SkyVector. It is by no means a complete user guide, but should help you get get started. As always, feel free to email info@skyvector.com with any comments or suggestions. Double check that the email address on your SkyVector account is the same as the email address used as the sign in on 1800wxbrief.com. Sign in to 1800wxbrief.com and visit your services provider settings page. Make sure SkyVector is enabled as a service provider and click "Save." If you don't already have a user account on SkyVector, click here to create one. You may want to use the same email address you used for your profile on 1800wxbrief.com. Go to your User Profile and fill in the fields for Pilot First and Last Name, Phone Number, Home Base Airport, and Home Base Airport Phone Number. The values in these fields will be pre-filled into the pilot information of your flight plans. 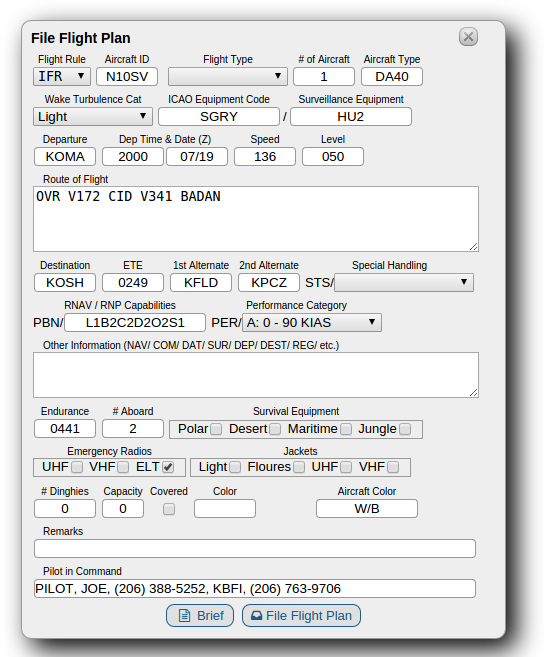 Open the flight planning form by clicking on the "Flight Plan" link on the home page. 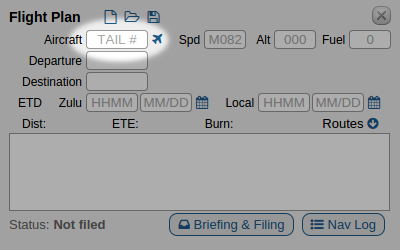 Enter your tail number into the flight planning form. Then press the Aircraft Icon to open the Aircraft Profile Form. Fill in all the details that apply to your aircraft. Remember the garbage-in, garbage-out rule about computers. If you enter inaccurate information in this form, SkyVector will compute incorrect flight plans. Note that climb and descent speeds are in knots in Indicated Airspeed (IAS) while cruise speeds are in true airspeed (TAS) (or Mach for Jets). For jet aircraft, enter your climb schedule as both IAS and Mach maximum speed. The computer will climb at your climb IAS to the crossover point, then continue the climb at your climb Mach. Takeoff and Arrival Extra Time and Fuel fields are optional, and can be used to add extra time and fuel to the beginning and end of a flight. Imagine that the last point in your flight plan is a VOR on the destination airfield. The flight planner is going to calculate your descent according to your descent speed all the way to the last waypoint and then to the airport reference point with no deceleration or maneuvering for landing. In a typical piston single, 1 gallon and 3-5 minutes are sensible values to account for gradually decelerating, entering the pattern and making a couple of turns in the pattern before landing. If you find that your en-route burns are accurate from point to point, but consistently behind by a gallon or two, add that much to Takeoff Extra Fuel. Similarly, if your expected times and burns are spot on, but you always land 5 minutes late, add that much to Arrival Extra Time. 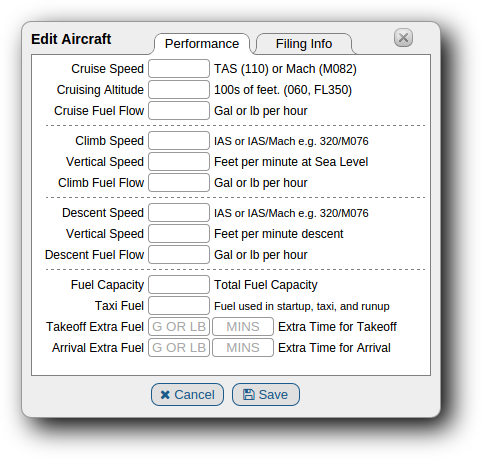 Select the "Filing Info" tab to continue setting up your aircraft. Your type may have been filled in for you if you have an American N-number. Either way use the ICAO 8643 designator for your aircraft type. Enter your 1 character FAA equipment code for use with VFR flight plans. Using the color picker, click the colors of your aircraft, in order of prominence. Select your Wake Turbulence Category. 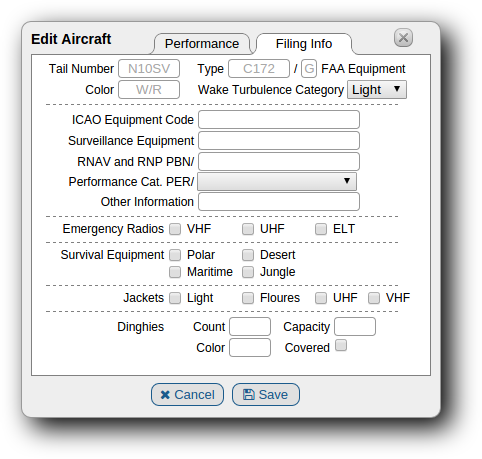 Use the Picker to select your ICAO Equipment Code. Check all that apply. The ones with no explanation are "You'd know it if you have it." For things that are common, but perhaps unfamiliarly worded, we've added some explanation. 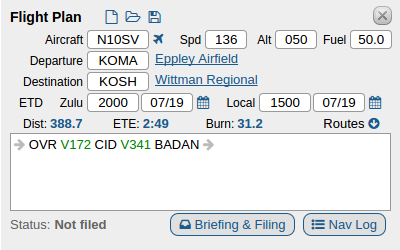 Other - Add appropriate codes to "Other Information"
Use the picker to describe your surveillance equipment, which is transponders and ADS-B/C equipment. Garmin has produced a helpful spreadsheet for their popular equipment which can be very helpful in select the correct surveillance and PBN/ codes. You may know for sure that you are Mode C, but in fact many newer transponders are Mode S, so check with your manufacturer's documentation. The PBN/ code is very important if you enjoy being cleared direct to places or like flying T and Q routes, or enjoy using RNAV and RNP procedures. If you have a Garmin GPS, check this spreadsheet for all of the modes supported by your gear. If you know of other reference documents for other equipment send them to us and we'll link to them as well. Bruce Williams does a good job explaining this section on his website at bruceair.com. Put any other "Field 18. Other Information" codes here. NAV/ is no longer necessary in the US, unless you want to specify only departure or arrival, not both. Otherwise a D in PBN/ will cover arrival and departure RNAV 1 and a C will cover Enroute RNAV 2. IDENT/N10SV can be used if you're flying under a Flight ID. CODE/A003FF specifies your Mode S Hex Code if you have ADSB Out. If you fly in the US, you should have an ELT, so check that. Check VHF or UHF if you have an emergency transceiver operating on those bands. If you carry life jackets regularly, indicate their features: Lights, Flourescent, VHF or UHF radios. If you carry life rafts, declare how many, their total combined capacity, their color, and whether they are covered. Enter your Tail, Departure and Destination. You can do keyword searches in the airport fields, and if the results are ambiguous, you can pick from a list of candidates. Enter your departure time in either Zulu or Local. Do not try to put in a local time if no departure airport has been selected. You can also use +N for a plan departing in N minutes, e.g. "+45." For a no-wind flight plan, enter 9900 in either ETD. Note, you will not be able to file without a valid ETD. If the system can offer generated, recently cleared, or ATC preferred routes between your airport pair, you will have the ability to view them by clicking on "Routes". Otherwise, you can create your own route by rubber-banding with the mouse, typing in the route field, or both. If you type something in the route field, Press Enter to have your changes computed. Press the Briefing and Filing button to open the flight plan form. Select VFR, or IFR as appropriate, and complete the filing form. Most entries should be pulled from the plan you just made, but you may want to add alternates and Souls On Board. Also check that all of the auto-filled information is correct and still applies to this flight. For example, do you still have your VHF handheld transceiver charged and in your flight bag? Press the Brief button to request a briefing. We will be adding options to email this to you, but at this point, if you want more briefing options, including talking to a FSS specialist, Press the File button to transmit this plan to Lockheed Martin Flight Services. Immediately after you receive confirmation of filing, you will be able to call 800-wx-brief and your briefer will be viewing exactly what you are. 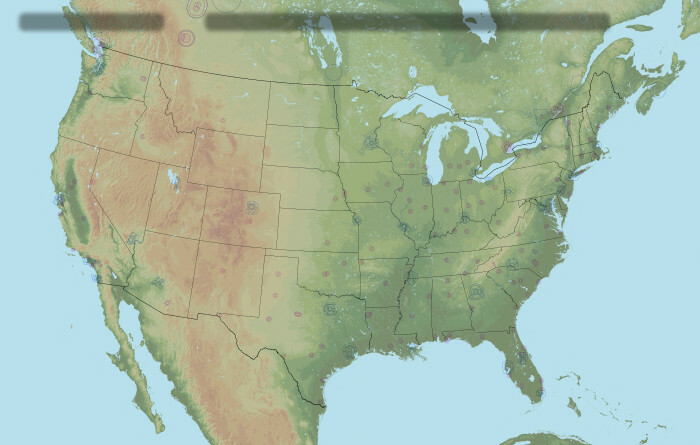 You can also log into 1800wxbrief.com and request a next-gen briefing, schedule an email briefing for the future, and more. Press the "File Flight Plan" button to transmit your plan to Flight Services. Once it is in their system you can amend or cancel it through SkyVector, over the phone with FSS, or by using the web portal at 1800wxbrief.com. IFR Flights can be amended or canceled until 30 minutes before ETD. At that point you must contact ATC directly. If you have configured your account to authorize SkyVector as a service provider, all of your communication preferences will be in effect. For example, EasyActivate, EasyClose, Adverse Conditions Alerts if a TFR pops up that affects you, filing notifications and ATC responses to your IFR flight plan. You can request a Nav Log at any time and at any stage during your planning. The NavLog will contain winds and temps aloft for every point in your flight, as well as Top-of-Climb and Top-of-Descent points. It is a PDF designed for easy printing, and contains blank fields to annotate your plan in flight.